Coastal Metal Service began operation in 1991, by producing its first 26 gauge 36" x 96" beaded flat sheet. Today, we are able to produce a wide variety of both exposed fastener and architectural/standing seam panels in over 30 colors. We have built our reputation for providing our customers with quality products, value added services and knowledgeable employees. From our in-house drafting department to our fleet of delivery trucks, Coastal Metal Service is truly your one stop shop for all of your metal needs. We can usually produce and deliver your order in a week to 10 days! Quality assured. Top to bottom, front to back, start to finish. > Click Here To learn why CMS is the best choice for your project. Our commitment to the customer has always been to provide the very best product available on the market and our people aren't satisfied until every phase of your project is completed the way you want it. Our objective has always been the "satisfied customer" who can rely on us to help solve problems and meet their needs through an immediate and long-lasting relationship. Custom panels and accessories are available from CMS. Radius panels and tapered panels are included in the custom products we manufacture. We can produce box-style gutter products up to 20 feet long. CMS has two 21 foot Computerized Folding Machines that allow us to offer coping and special order trim products for many residential and commercial projects. Painted steel, painted aluminum, copper, and bare galvanized steel are but a few of the materials that we can work with. 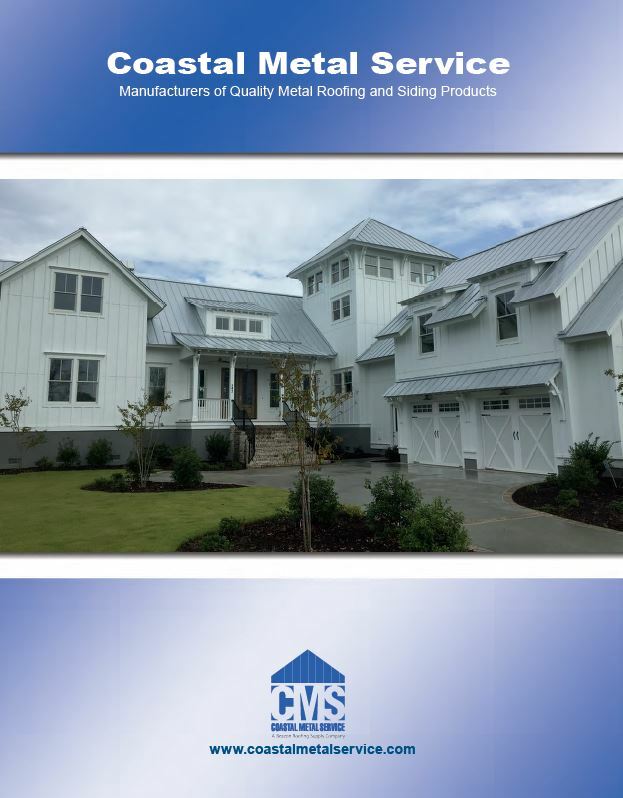 CMS is one of the few manufacturers that produce custom trim and accessory items for our roofing and siding panel customers routinely. Coastal Metal Service is a member of Beacon Roofing Supply, Inc. the largest publicly held distributor of residential and commercial building materials throughout North America.